As reported earlier on VeloNation, top US talent Taylor Phinney has signed a deal to compete with the BMC Racing team for several seasons, making his full pro debut with the American squad. He has said that he believes joining the team is a logical next step in his career. 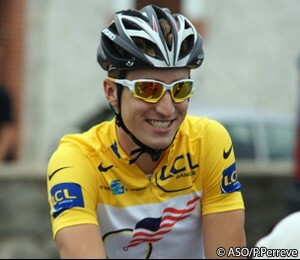 Phinney will head to the Olympic Games in 2012 as one of the big favourites for track medals. He is a double rainbow jersey winner in the individual pursuit and said that an additional factor in his decision was knowing that he will have some good equipment to use there. “BMC also makes fast bikes. I'm excited to see what they can make for me on the track,” he said. The son of double Tour de France stage winner Davis Phinney and Olympic gold and world champion cyclist Connie Carpenter, he has been regarded for several seasons as one to watch. Back to back wins in the aforementioned individual pursuit and in the under 23 Paris-Roubaix have highlighted his class, and several teams were interested in getting him to sign on the dotted line. This interest was further heightened when he won the US Elite time trial championships on Saturday, edging out Levi Leipheimer, one of the world’s top specialists at the discipline. Phinney has competed for the past two seasons with the Trek-Livestrong squad. It’s a feeder team for the ProTour RadioShack team, but as the latter has guaranteed backing for just one more season, he wanted to find a longer-term deal. He’s already ridden strongly against the pros, netting two stage wins in the recent Larry H. Miller Tour of Utah, and proving he gets a good racing programme, he should settle in well. “I'm looking forward to getting into pro racing, riding the front and doing my duties while seeing if I can win some races,” he said, showing that he willing to learn while also retaining his natural ambition. The BMC Racing Team includes several top names, including the current world road race champion Cadel Evans , who will aim to defend his title in the elite road race on October 3rd. Former champion Alessandro Ballan and 2009 US road race champion George Hincapie are also amongst the big hitters on the team, and will be able to take the pressure off Phinney as he develops and settles into the paid ranks.